Martin Corey has spent almost four years in Maghaberry prison. At no time during that period was he ever questioned about or charged with any offence. He was held on the basis of secret evidence - if such evidence ever even existed - which his own legal team was never allowed to see, let alone challenge. 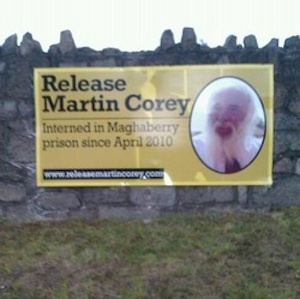 In short, Martin Corey was effectively interned without charge and without trial for almost four years. Despite his release from prison, Martin Corey is now subject to conditions comparable to those which first saw the light of day under the draconian Special Powers Acts introduced by the Unionist regime at Stormont in 1922. He has been ordered not to reside at his home in Lurgan or to enter the Lurgan area. He has also been ordered not to speak to the media about his case. Internment without charge or without trial was a feature of the Special Powers Act. Another of the Special Powers Act regulations allowed the then Minister of Home affairs to prohibit any person from entering all or parts of the Six Counties or to grant permission for a person to reside under certain stipulated conditions. This was later condemned by the Commission of Inquiry into the Special Powers Act held by the National Council for Civil Liberties in 1936. Section 25 of the Special Powers Act amounted to censorship of the rights to freedom of speech and political opinion. It prohibited any person “by word of mouth, or in writing, or in any newspaper, periodical, book, circular, or other printed publication” from making statements likely to cause “disaffection to His Majesty” or statements critical of the policing and justice system. The repeal of the Special Powers Act was one of the core demands of the Civil Rights movement. Although it was repealed in 1973, it has been incrementally replaced over the past forty years by harsher, if not more draconian, legislation. The legislation which allowed Martin Corey to be imprisoned for four years without charge and without trial, and the conditions imposed upon his release, resemble those of the Special Powers Act against which the Civil Rights movement campaigned. Martin Corey is not unique. Other persons have been arrested under dubious circumstances and spurious evidence, and have yet to face trial - as such they are innocent until proven guilty. A number of these are being granted bail on conditions which prevent them living in their family homes and from entering their home towns. Like Martin Corey, they are faced with internal exclusion within the Six County state - not unlike the internal exclusion practiced by the Pinochet regime in Chile. The ‘old’ Stormont with its bad, old laws is long since gone - at least that’s what constitutional nationalist parties in the ‘new’ Stormont keep publicly repeating. To all intents and purposes, those same politicians who clamoured for a return of justice and policing powers to Stormont appear to be comfortable with, if not complicit in, the special powers enacted and enforced under their watch. Slowly but surely, the old Stormont ways are being resurrected.